Watsisname, is that correct? if so can you give another bodies to caculate? with given mass or density. if i have density i will know how to caculate the mass. today i caculate the mass of a boulder that is inside the western wall here. if the boulder is 14meters length, 3.5meters wide and 3.5meters height. now the known density of the boulder is 4.2 grams per square centimeter. we want to know the boulder mass in kilograms. also now i know to caculate your weight in an elevator if the acceleration of the elevator is known. now 50x(5+10) 5 is the accelration of the elevator while 10 is to do it in Newton units so 50x10 is to caculate the weight in Newton units. you will weight 750 newtons or 75 kilograms, that also can explain why when the elevator go up you feel heavier. that why when the elevator goes down, you feel less heavy or even float abit given your weight is very low or the accelration is pretty high. Yep, density is mass per volume, and volume has units of length cubed. Length times length times length. Mass per length squared is a 'surface density', (think the density of a thin sheet of foil or something like that). There is also a 'linear density', which is just mass per length (think the density of a long straight wire). But for your purposes here you want mass per volume. Your calculation for Earth's density is correct. The idea is to take the mass of the Earth (about 6x1024kg), and divide by the volume of the Earth (4/3*pi*(radius)3), where Earth's average radius is about 6371km. This gives about 5500kg/m3. Does the result make sense? Well, this value is somewhere between the density of rock and the density of solid iron. So yes, it makes sense for a planet which is made up of a metal core with a rocky mantle. Your result for the mass of the boulder is correct, too. Nice work on the unit conversions. That can be a tricky part of this kind of calculation. Do you feel comfortable with it? If not, I can give you some further help -- there is an easy method for writing it out so that it makes sense and you'll be less likely to make mistakes. And finally the elevator. You are 3 for 3 -- correct answers all across the board! Well done! The way I solve or explain the physics behind the elevator problem (and being thorough) is with a free body diagram. This is using the ideas of Newton's Laws, forces and vectors, which you should either be developing now or very soon in your physics. If you haven't seen any of this yet, then don't worry about it. Newton's Second Law says that the sum of the forces acting on an object is equal to the object's mass times its acceleration. The forces and acceleration are both vectors, meaning they have a magnitude and a direction. We can draw them as arrows. As a picture, the second law is telling us that adding the arrows for all the forces on the object together should give us a new arrow whose length and direction represents the acceleration. The elevator is accelerating up, and since you are accelerating with it (you neither fall through the floor or fly up into the air), your acceleration vector must be pointed up. You know the force of gravity is pulling you downward, and its strength is mg (your mass times 9.8m/s2). For your acceleration to be upward, the sum of the forces acting on you must also be upward. So there must be another force, upward, with a strength greater than mg. The only force this could be is a "normal force" -- the force of the elevator floor pushing up on you. We'll draw it as an upward arrow labelled "FN", with a length longer than mg. So the force that you actually feel is greater than the gravitational force (mg). It is mg plus your mass times the elevator's acceleration. A similar argument with the elevator accelerating downward will give us mg-ma. 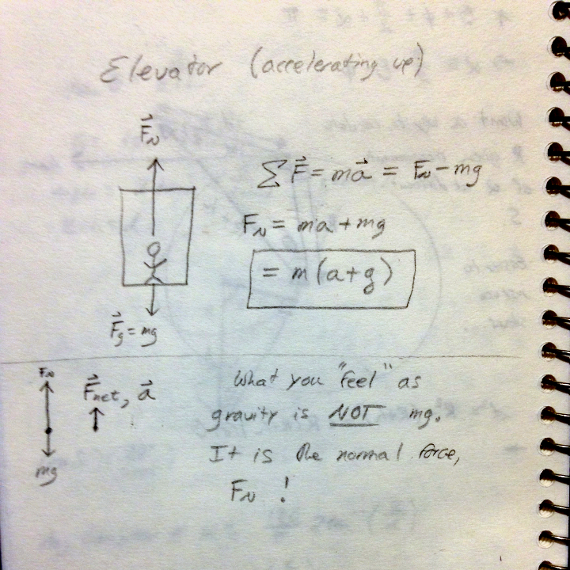 If the elevator were to accelerate downward with a=g, then the normal force on you is zero. You are in free-fall and seem weightless. A neat lesson here is that you do not feel gravity! Even in freefall, or in orbit, there is still a gravitational force mg acting on you. What you actually feel are normal forces. The force of the elevator, or the ground, pushing you up. Watsisname, i am familiar with all of the equations but still take me time to fully understand it. can you explain to me how to know in which diraction the Net force is? when i draw it like in what you did i have hard time to find the net force. the mg and normal force are ok but the net force i always stop there. Ah, well there's a few things to say about that. First, have you been introduced to vectors and how to add them? If not, then you don't need to worry about the drawing. How to know the direction of the net force. In this case, we know the direction that you are accelerating. It must be upward, same as the elevator. Then we know the direction of the net force (the combination of all the forces acting together) on you as well. Newton's Second Law says the direction of the net force on an object is the same direction as its acceleration. Now what if we are trying to find the net force, but don't know the acceleration? What if all we know are the directions and magnitudes of each of (possibly several) forces acting on it? In that case, we can use vector addition. The idea is to represent each force with an arrow, whose direction corresponds to the direction of the force, and its length corresponds to the magnitude of the force. Then the net force is found by drawing all the vectors together, tip to tail. A youtube video explaining this can be found here (particularly from 3:35 to 7:55). Also, I forgot you asked for further examples to practice on with density. So I'll give you one. Hopefully not too challenging, but I also don't want to make it trivially easy. Consider the Earth. 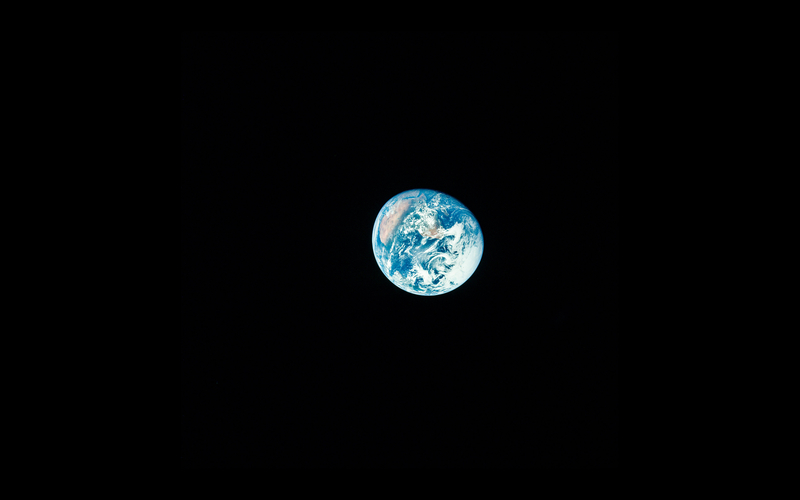 Our beautiful blue planet. Let's crush it until it becomes a black hole. How dense would the Earth be, right at the moment we crushed it enough to form a black hole? Added: Oh, and let's say you have until November 13 and I'll post the solution then. I don't want you to feel pressured to work on it too quickly. Watsisname, mmm didnt understand much how to do the massxgravitational constant. Yes, the way you wrote it is exactly right. The mass and the gravitational constant are numbers, but both numbers have units associated with them. In the MKS ("meters-kilograms-seconds") metric system, mass is measured in kilograms, and the gravitational constant is measured in cubic meters per kilogram per second-squared. If we multiply G by M, then the units will be (m^3)/(kg*s^2) multiplied by (kg). The kilograms will cancel, leaving (m^3)/(s^2). Then you'll get new units again after you divide by c^2. Indeed, it should simplify to just meters, since the units on the right hand side of the formula must be the same as the units on the left hand side. The left hand side is R (radius), which is in meters. This technique of working with the units, or "dimensions" of the quantities in a calculation is known as "dimensional analysis", and is a very useful tool. What if Jupiter was a brown dwarf? I'll run a Universe Sandbox simulation overnight and inform you of the answer tomorrow. So, if Jupiter was 30 times its current mass, but had about the same orbit, then within just a few thousand years it would make all the planets beyond its orbit be pulled inward in such a way that the orbits would be very eccentric and Saturn would be in danger of being slingshotted out of the solar system completely. As for the inner solar system, the orbits would stay stable but Earth might get hit with a few asteroids because eventually Jupiter's gravity would slow down most of the asteroids in the asteroid belt, especially the smaller ones, and they would fall into the inner solar system. I mean if it was like that from the start if it formed that way. Well in that case, the planets that are now beyond Jupiter would probably have to be farther away from the sun then they are now, and Saturn would probably be either smaller or nonexistent, there would be no asteroid belt and most of that debris would probably be moons of Jupiter or would be Earth-orbit-crossing asteroids, and Mars might either be smaller or more likely nonexistent, and due to the higher number of impacts here on Earth, life would either not exist or be very different. Here's the article I was talking about. Here's something more in the realm of psychology: Why do most people find extremely high fields of view attractive, in terms of pictures and video game screenshots? Or why are wide fields of view considered pretty and low fields of view considered ugly? Interesting question! My guess (and it totally is just wild speculation) would be that it derives from our hunter-gatherer days. Being able to see a wider view of your surroundings is beneficial to gather information about food, resources, predators or rivals and approaching weather. It could be related to why we associate views from high places and mountain tops as being aesthetic.